Stephen flickered slightly. This was the only outward manifestation of billions of calculations, extrapolations and contingency subroutines activating and processing. In a picosecond entire Avatar interaction programs came online as others went dark. The comfortably paternal Professorial persona he had used to explain why the trader couldn't travel through the rocky foothills behind him subtly roughened, hair becoming more leonine, beard more Jovian. The clothing slowly transitioned from Etonion tweed to an intricately folded grey cloak the mind could trick itself into believing it had always been. Fourth Grade reading level activated. The trader reared back scowling. He wore rough homespun clothing and a venomous beard. The creature he led on a piled high with roughly tied bundles looked sort of like a shaggy donkey but their were subtle anatomical distortions Stephen noted and filed under worrisome. Stephen almost sighed. His working model of macro-culture retention and enclave led bounce back downgraded significantly and his form transformed as well. A wind blew up out of nowhere and swirling black clouds began to spin into existence out of nothing directly over the dusty remnants of crossroad that once had been highway interchange they stood in. 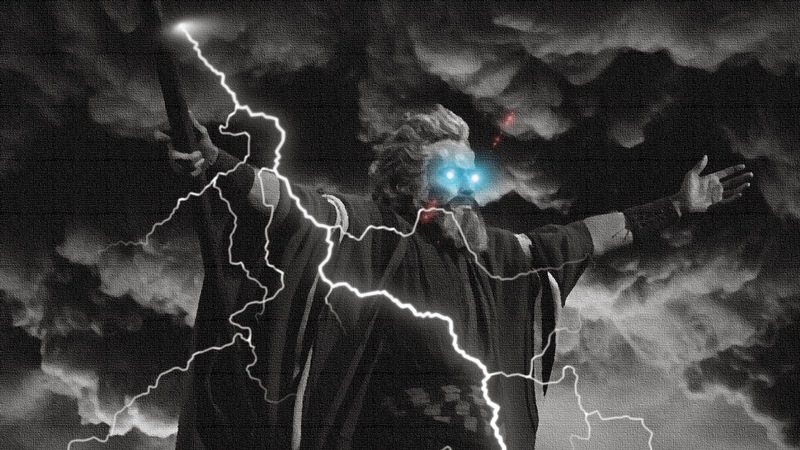 Stephen flung wide his arms as his avatar completed its final transformation based largely on Charlton Heston's appearance as Moses. He was taller, inhumanly tall and his eyes seemed to smoulder. His stentorian roar put the howling winds and crashing thunder that had sprung up out of a clear blue sky around them to shame. Stephen kept that stuff up for a while despite the trader and his donkey taking to their heels back down the foothills road as soon as the shock and awe light show began. The black clouds and multiple lightning strikes could be seen across the river valley below for hours. The corridors of computer banks and storage tanks under the mountains behind him went into long term energy savings and self repair triage mode. Stephen slowly melted away into a flickering cloud of dust in a mesh of sparks. Then even that disappeared swept up in the winds. It was going to be a long millennium.